I don't have a photo of the final kraut, just this one when it was freshly made. out to give the kraut a nice soft colour too. Cracked into the second batch of krautchi that i made at the weekend and it was SO good. It's just so easy and yet so tasty. I absolutely recommend you get this stuff on the go in your kitchen. I'm going to still be playing around with mixtures, but i will be making a double batch of this one again soon. It was 1 white cabbage, 1 red onion, 1 carrot, 2 cloves garlic, small piece of ginger, some dried chillies and about a tablespoon of coriander seeds. I sliced the cabbage, onion, garlic on a mandolin, grated the carrot and finely cut the ginger. Just put all those veggies in a big bowl and sprinkle on about 1 tablespoon of salt (Himalayan pink for me). Then crunch it all up with your hands for about 10 mins, until it's dripping with juice. Then i added the seeds and chilli, mixed it all through and packed it down hard into my jar, you want it all covered with the liquid. Cover it with a couple of the outer cabbage leaves (give it another shove down with your knuckle) . Leave it for a couple of weeks... or more. Done. Easy! My first kraut that i made at the class was ok, but i was expecting more in the flavour, more fermented. It just tastes like nice cabbage in a very mild brine. I can happily eat that, but it's lacking. I shall just leave it longer and see how it changes. This newer one was just more like i was expecting. It has a good zing to it. The small onion definitely helps for me and i love the little coriander hits! I've been mixing the two krauts together, which also works for me. Going to make a fermented hot chilli sauce this week i think. 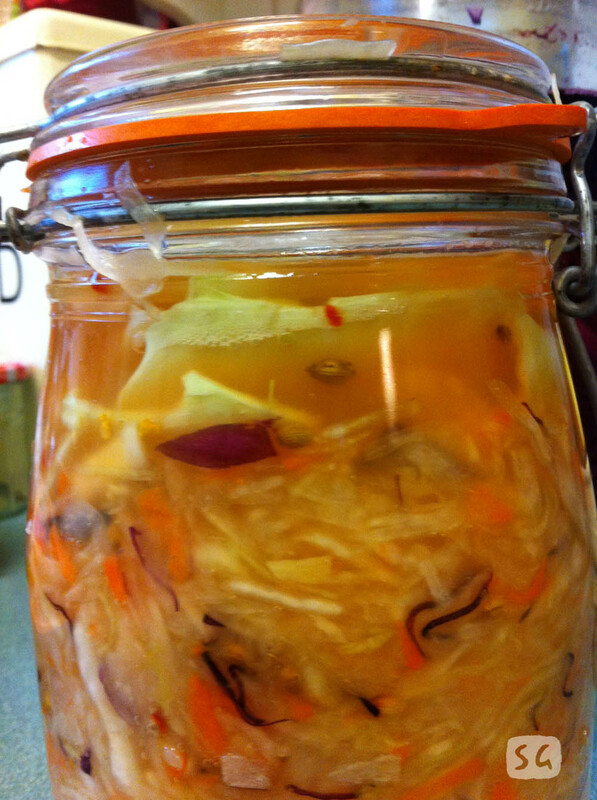 Tracey has more fermented stuff going on her blog too at the moment so pop over there and have a look. Or head over to Sandor Katz's Wild Fermentation if you really want to go fermental! Making this one today! I didn't make a kraut, made the kimchi instead. The recipe called for fish sauce and I think next batch I will cut back on that some, it tasted like a sushi roll, and while it was good, I would like it more for sandwiches and add ons for other things. Of all the things I made, I liked the radish/ Apple ferment and the hummus the best. I can definitely tell a difference in my digestion in just one week! That spinach hummus looked awesome Tracey. We'll be making that! Keep sharing your news and recipes, yours always look so appetising!